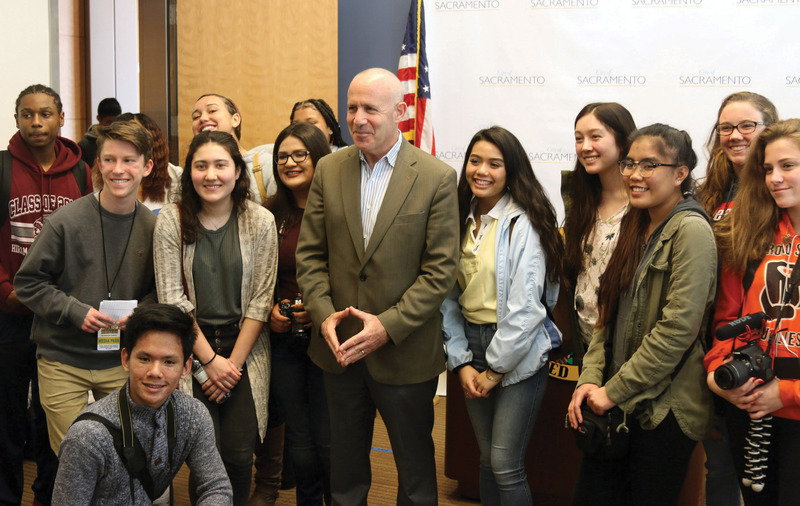 Shortly after Kennedy’s evacuation from a bomb threat on Friday, March 16, 2018, Sacramento Mayor Darrell Steinberg held a press conference at City Hall with students from local high schools to discuss concerns on school safety and the importance of student-led movements that demand gun control. First brought to attention was the increase in the number of high schools in Sacramento that have experienced a threat in the past few months. These occurrences have prompted concerns from students on whether school safety protocols should be reformed to ensure the safety of everyone at school. Upon addressing the evacuation at Kennedy, Steinberg agreed that a “talk about protocols” should take place to make “a clear understanding when an evacuation is appropriate and when it isn’t necessary.” He felt the actions taken that day at Kennedy by the Sacramento City Unified School District officials and the Kennedy faculty to be highly appropriate. “If there’s any real doubt about it, public safety [and] the safety of the students need to come first,” he said. The mayor also took into consideration the mental and emotional impact such an experience could have on a student and their family and teachers. Many schools have seen a significant reduction in school attendance as a result of continuing fears. To improve the situation, Steinberg expressed the need to have more support outlets within schools, whether it be more counselors, more mental health resources, or more community outreach programs so that no one struggles alone. “We need to deal with the impact on the students and the teachers, and the entire school family when these sorts of things happen because they’re traumatic,” he said. The national school walkout day that took place on Wednesday, March 14 was used not only to honor the 17 students who lost their lives in the Stoneman Douglas High School shooting but to amplify voices of minors throughout the country. The walkout united students together to demand gun control and was supported by a majority of schools and officials, especially Steinberg, who believes the voices of students should be heard first. To silence students on what they believe in for a mere 17 minutes, especially if they had participated in the event the same way Hiram Johnson had, was, in his opinion, not right. In a time where guns come easy and students are left to take extreme measures to demand change, Steinberg made it his wish that all students live their lives freely, even with the obstacles that will be faced in the future.